← Bodybuilding at 60 – Quest For My Best! Weightlifting nutrition is an individual pursuit – yes, you burn a lot of calories when lifting weights, but how many calories and what your replacement levels are is dependent on your specific metabolism and your goals. For best results you need to start with a specific program and then modify your daily caloric intake based on your results. Why are you lifting weights? Are you trying to lose weight? Are you trying to build muscles? Are you just looking to improve your overall fitness? Each of these goals requires a different daily calorie intake, so it’s important to know what you’re aiming for before you begin. If you’re like most people, you only have a vague idea, at best, of how many calories you’re presently consuming. Why is that important? Because what you’re currently eating has brought you to your current weight and your current body composition. You’ve been giving your body the right number of calories for the muscle you’re carrying and for the bodyfat level you currently have, assuming your weight has been fairly stable lately. You don’t need to become a nutritionist necessarily, but you DO need to know the difference between carbohydrates, protein and fats. While all three are important to your daily diet, they’re not the same. As an example, carbohydrates and protein have 4 calories per gram while fats have 9 calories per gram. Part of figuring out the right number of calories for your daily intake will involve knowing what ratio of macronutrients you should be ingesting. One helpful tool is a book of food counts – numerous exist so you shouldn’t have trouble finding a good one in your local bookstore or online. For simplicity’s sake, let’s start with your current daily calorie intake. Since you already now the results from that level, you can start making your adjustments from there. Protein level is the first step, since it’s mandatory to build muscles and needs to be high enough to protect your muscle level when you’re trying to lose bodyfat as well. The most commonly-quoted target level for daily protein intake is .8 to 1.2 grams per pound of bodyweight. Obviously, if you’re looking to lose weight aim for the lower end of that range, and the top of the range if you’re looking to build muscle. If you’ve been lax in tracking your calorie intake to this point, there’s a good chance you’re not getting enough protein each day, so that’s the first thing to fix. There are easy ways to add in more protein – eggs instead of cereal for breakfast, tuna or salmon instead of peanut butter and jam for sandwiches, and always having meat, fowl or chicken with dinner each night. Protein shakes and supplements help too, but remember they’re called ‘supplements’ for a reason – they’re to add to your proteins from foods, not to replace them. Once you’re sure you’re getting enough protein each day you can start to modify your overall daily calorie intake based on your goals. If you’re looking to build muscle, add in the necessary amount of protein each day to get you to the 1.2 grams per pound of your bodyweight and give your body a week or two to get used to that level of calories. To grow from there, every couple of weeks add in another 200 – 300 calories a day by increasing your complex carbohydrates – sweet potatoes or yams, brown, red or black rice, steel-cut oatmeal, broccoli or brussel sprouts, etc. At first this is easy – simply add a meal with protein & the new carbs an hour before you start lifting weights and/or an hour after your gym session. Keep an eye on your stomach – you can keep increasing your carbs a bit every two weeks or so until you start to see a bit of an increase in belly fat. Once that occurs cut your carbs back that last 200 or 300 calories per day – you’ve found your current effective daily calorie intake. Remember, though, as you continue lifting weights and eating right you’ll be adding new muscle mass, so every month or so add just enough protein and carbs to match your then-current bodyweight. If you’re lifting weights to torch body fat, there are two things you MUST remember up front. First, your goal is NOT weight loss – it’s fat loss. Strictly restricting calories from the start will cause you to lose weight – but a goodly-proportion of that weight loss will be muscle loss, and that’s not your goal. Many people are very surprised when they start lifting weights to find their clothes getting looser, their waistline shrinking but their weight going UP. This is because muscle is much denser than fat, and therefore heavier for the same size. Don’t let that bother you – focus on how your clothes fit or have your bodyfat percentage measured by your doctor or a certified personal trainer. Second, understand that the calories you eat, and the source of those calories, will determine whether you’re losing fat or not. Yes, you’re burning extra calories when lifting weights. Yes, you’re building muscle and more muscle burns more calories 24/7, even while you’re sleeping. But these will NOT be enough extra calories burned to make a big difference – especially when compared to the difference your nutritional choices can make. As with those trying to build lean mass, start by getting your protein intake into range. If that means you’re getting more calories each day from protein, cut back the equal amount in the carbohydrates you’re eating daily. You’ve figured out how many calories you’re already eating each day, and 20% of those calories should be coming from healthy fats – especially Omega-3’s. Once you subtract that 20%, plus the calories you’re going to be ingesting from protein, the remainder come from carbohydrates. 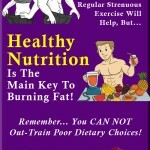 Every 2 or so reduce your daily carbohydrate intake by 200 – 300 calories. This won’t cause sudden fat loss, but it will slowly force your body to start burning stored energy – body fat – to fuel your daily activities and your weightlifting sessions. Larger or more sudden caloric reductions can trigger your body to slow your metabolism, and that’s not what you want, so keep to the slower reduction. Remember NOT to use the scale to judge your progress – base it on body fat measurements or how your clothes fit around the waist. You can reach your goals, be it reduced body fat or bigger muscles, as long as you use proper nutrition for lifting weights and keep your daily calorie intake in line with your current body composition, your activity levels and your goals. And with improved health, a stronger system and a better-looking body as the side benefits, it’s certainly worth the effort you’re putting in – see you in the gym! 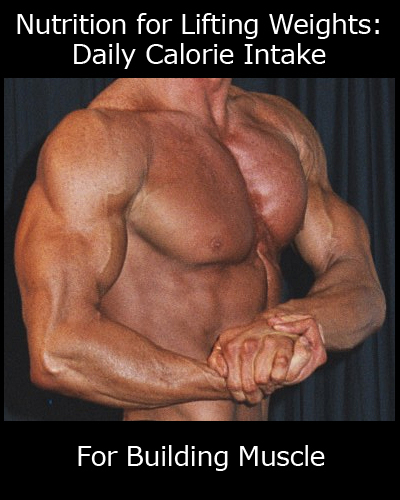 This entry was posted in Healthy Nutrition and tagged build muscle, burn fat, calories, daily calorie intake, lifting weights, lose fat, weightlifting. Bookmark the permalink.